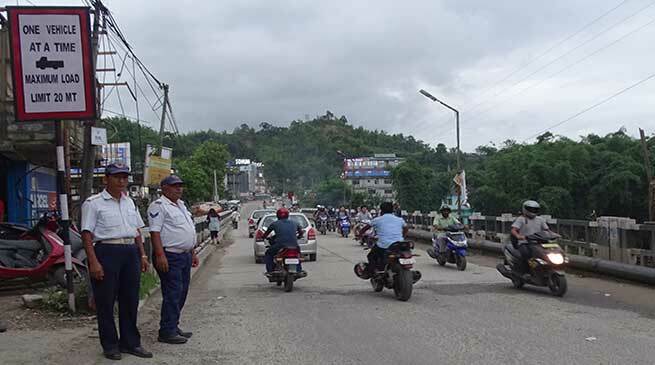 Plying of heavy vehicle prohibited on the Borpani bridge as seen traffic police regulating round the clock since this morning. SP Papum Pare Incharge Capital Tumme Ammo said that plying of heavy vehicle have been totally restricted as the bridge have been slighlt eroded toward Naharlagun side and only light vehicle will be allowed to go. No heavy vehicle will be allowed to pass until the bridge is fully repaired. Meanwhile Parliamentary Secretary and local MLA Techi Kaso today inspected the ongoing restoration worked and directed the engineers and workers of Highway department and M/S T. K. Construction to expedite the work. He also directed them to carry the work without and the road need to be make through for vehicular movement by tomorrow evening. EE (Highway) Nani Tath said that the workers have been doing the work 24 X 7 and being changed shift wise to complete the formation in the given stipulated period.